His next project on race, he said, will be rooted in his arrest. "I hope to make a documentary about racial profiling for PBS," he said. "[The idea] had never crossed my mind but it has now." He said the documentary will ask: "How are people treated when they are arrested? How does the criminal justice system work? How many black and brown men and poor white men are the victims of police officers who are carrying racist thoughts? "I want to be a figure for prison reform. I think that criminal justice system is rotten." A lifetime of study, and it's a personal experience that makes him question the criminal justice system about what we know, and how we know it, and what matters most to us is pretty much what happens to us. Sad how much we let systems do our thinking and experiencing for us, and how much we depend on personal experience to know anything about the world. Not a critique of Mr. Gates, or his next project; just an observation. I have some photos of the moon landing. They're as grainy and gray and fuzzy as the pictures you've seen recently, from the TV broadcast. I still remember Walter Cronkite giving the technical details for photographers, to adjust their cameras to get the best picture from the TV screen. A friend with a darkroom and an interest in photography took them and made copies for me, so they're on curling photography paper from a garage dark-room, not professional prints on Kodak paper. I used to have a map of the moon, too. The near side, and in black and white (I think Calvin's Dad was right, sometimes, and the world was in black and white in the past). It hung on my bedroom wall, and I marked the places of the moon landings on it. I even built some of the Revell kits of the Mercury and Gemini and Apollo rockets and capsules. At one point I had a model of the Lunar Module, if memory serves. I still remember when the acronym for it went from LEM, for Lunar Excursion Module, to LM, for Lunar Module. I still called it "LEM" for a long time. I remember the night of the moon landing. I remember the den where I watched it, in a friend's house, with my family and theirs. I remember Walter Cronkite talking, I remember the amazing pictures actually coming from the Moon. But my strongest memory is the one no one has talked about, although to me it was even more amazing. In this age of giant TV screens and international communication, where I can pick up a phone and talk to my daughter in Brooklyn as if she was in the next room, and always know I'll get her because I'm calling her cell phone, in this age where everybody knows, or can know, what's going on anywhere in the world at any time, where I can read newspapers from around the world at my desk, this memory is wholly unremarkable. But it shouldn't be, anymore than the moon landing should be unremarkable. 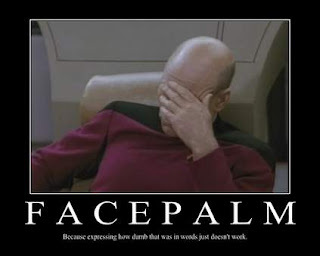 I hear now that we went to the moon to beat the Soviets, and I remember the "space race." But while it felt that way for the 7 original Mercury astronauts, it no longer felt that way by 1969. I don't remember feeling triumph at having defeated the Russian advance into space, which, after all, had disappeared by then. 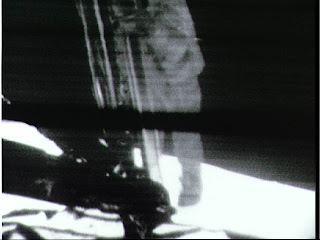 What I remember was the wonder when Walter Cronkite showed us that people around the world were waiting for Neal Armstrong to be the first human being to set a foot on the surface of the Moon. This was extraordinary, too; and possibly as unprecedented in human history as the moon landing itself. Around the world, despite the hour of the day depending on what point on the planet people were, people were gathered around television screens waiting to see the amazing sight. 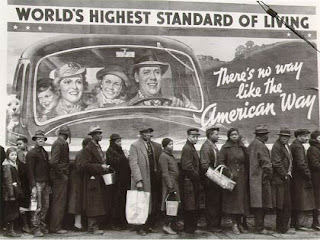 It was a human effort that day, not a USA effort. It was humankind that set foot on that dusty surface, not just an American. Everyone everywhere, the TV told me, the pictures told me, was watching: watching, and for the moment, the hour, the event, feeling the same emotion. It wasn't a magical Hollywood moment, but it gave a sense of common humanity, of shared experience, of how much more alike we are than different. It was a technological triumph. But the response was almost....spiritual. I knew this 30 years ago. No, really. When you read the emails by Gregory, King, Stephanopoulos and others, you start to understand why most major network interviews with politicians tend to be a lot less hard hitting than they need to be to really hold their subjects accountable. The politicians themselves have the power to make or break the networks, by granting or withholding access. That ends up meaning that, consciously or not, the networks soften their approaches -- both in their pitches, and in their actual interviews -- in exchange for that access. That's how the world works, and it's hard to know what to do about it. It must have been in Harper's Magazine, which I was reading devotedly at the time. I was also watching "This Week with David Brinkley" as if I were an acolyte in the Church of News. Then I read this article pointing out that none of the journalists (or George Will) ever asked sharp questions of the "guests" because they would lose all access to the politicians who are the only reason anyone tuned into those shows on Sunday morning. And this, of course, was back when most people were in bed or in church on Sunday morning, and the Sunday morning talk shows were A) a snoozefest that B) nobody paid attention to. Before McLaughlin, in other words, changed the TV landscape forever, and ushered in the era of Cable News as we know it today (i.e., before CNN was Fox-ified). Walter Cronkite never did a Sunday morning show with "guests." When he talked to politicians, he was still a journalist. He reported the news of my childhood: the death of Kennedy; the Democratic Convention in'68; the moon landing. 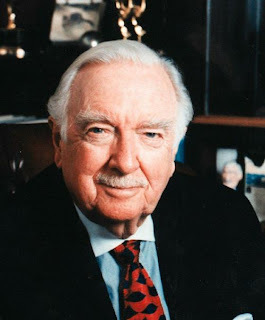 God be with you, Mr. Cronkite; and with your family. Planning the summer vacation. Had to get my map out. A few years ago, when I was visiting the Dominicans in the Czech Republic, I spent the night in a small town called Snojmo near the Austrian border. There was the usual meeting with the Dominican Family. There were lots of young families with their noisy offspring, and we feasted on delicious sausages and drank slivovitz. Then we had an open discussion, and the first question was from a young woman who asked how she could transmit the Church’s moral teaching to her children, who seemed to be just as resistant as children in Western Europe. I did not know how to answer the question and so I passed it to my companion for that trip, a moral theologian called Wojcieh Giertych, professor at the Angelicum University in Rome. This Matt Taibbi article is getting attention because it purportedly rips the lid off of Wall Street scandals and goes to the heart of what ails our economy. While this book is more worthy of our attention, as it discusses the "invisible poor" in America at the height of the "boom" in the American economy. I'm listening to the author talk about places in America labelled "food deserts" because there is no food available within 100 miles, except from gas stations selling "junk food." Imagine such a term being a part of the vocabulary of people who care for the poor in this country, and try to help them. Imagine such a word applying to this "land of plenty." As the author points out, we used to expect to be wealthier than we already are, and lived and spent into that expectation. Thus did the economy grow, but thus, too, were bubbles created. There are strong indications this continuous growth not only cannot continue, but has come to an end. But the expectation hasn't; yet. And the problem is not the perennial one of market manipulators; it is that the poor will always be with us. The question is: will we always ignore them? *Be kind to your web-footed friends. For a duck may be somebody's mother! Be kind to your friends in the swamp! Where the weather is very, very damp! *Tune: Stars and Stripes Forever, 3rd movement, if you're wondering. I have a soft spot in my heart for Mitch Miller, what can I say? Is it me, of have conservative politicians suddenly decided it really is all about them, and this decision is leading to self-destruction? The similarities between Sarah Palin's resignation announcement and Mark Sanford's statement are eerie. And it isn't lost on me that both of them assure us they are taking these actions in the name of, if not on behalf of, God. Or at least because they are so certain this is what God wants. I want to discuss, a bit later, Locke's "Letter Concerning Toleration," and this is an almost perfect chance to do that. But the weirdness has to sink in, or slink away, or something. This is just really, really, odd. Not exactly unexpected, if you understand that excessive self-regard usually leads to self-destructive acts (destruction of reputation, if nothing else); but as to what it all means...well, that requires some reflection on Locke and Kierkegaard and the bewilderment of current events. So in the aftermath of this failure I want to not only apologize, but to commit to growing personally and spiritually. Immediately after all this unfolded last week I had thought I would resign - as I believe in the military model of leadership and when trust of any form is broken one lays down the sword. A long list of close friends have suggested otherwise - that for God to really work in my life I shouldn’t be getting off so lightly. While it would be personally easier to exit stage left, their point has been that my larger sin was the sin of pride. They contended that in many instances I may well have held the right position on limited government, spending or taxes - but that if my spirit wasn't right in the presentation of those ideas to people in the General Assembly, or elsewhere, I could elicit the response that I had at many times indeed gotten from other state leaders. Their belief was that if I walked in with a real spirit of humility then this last legislative term could well be our most productive one - and that outside this term, I would ultimately be a better person and of more service in whatever doors God opened next in life if I stuck around to learn lessons rather than running and hiding down at the farm. Because the whole point of humility is that it's NOT about you. The whole point of humility, just like the whole point of identifying pride as a sin, is to remove yourself from the center of the world, and recognize the importance of others. But in Mark Sanford's case, the humble thing to do is to treat the Governor's office like a hair shirt, and his continued political career as penance. Thomas More this guy ain't. Worse than that, he doesn't even understand why he's not approaching sainthood with such a public display of sacrifice. A sacrifice that isn't a sacrifice at all, of course, because what he's offering on the public altar is his wife, his children, his marriage, any possible sense of shame or culpability, everything except his ego, his libido, or his pride. I suppose you could read that as: "So go ahead and get her in bed!," but I don't think that's what Jesus meant. They have also made the point that a good part of life is about scripts - that the idea of redemption isn't something that Marshall, Landon, Bolton and Blake should just read about, it's something they should see. Accordingly, they suggested that there was a very different life script that would be lived and learned by our boys, and thousands like them, if this story simply ended with scandal and then the end of office - versus a fall from grace and then renewal and rebuilding and growth in its aftermath. Yeah, this is all about teaching his kids. Sure it is. What's really astounding here is to listen to this man preach on the sin of pride while displaying such conviction as to his own self-importance. 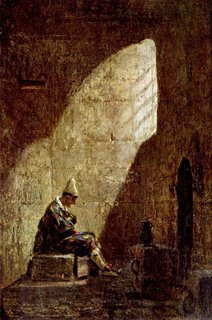 He wasn't handed his head by the SC Legislature and Supreme Court (the former overrode 10 of his vetoes, the latter forced him to take the stimulus money he said he wouldn't take) because he was wrong; he was rebuffed because he wasn't in the right spirit to carry God's message to a government that desperately needed King David to save it from the grip of evil, a grip he knows because Cubby Culbertson told him it wasn't Mark's fault he had to go to Argentina or New York or outside South Carolina to sleep with his mistress. So now he has to bring his hard-earned humility to South Carolina, as a purified vessel of God's will. It takes a humble man to realize how important he is, and how important it is to God that he stay and do what God wants, because it just happens to be what Mark Sanford wants! 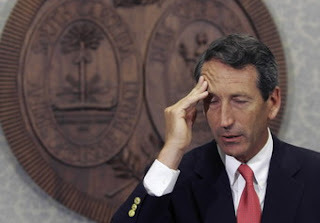 And that's the lesson he wants to pass on to his children: God wants what Mark Sanford wants. And that's what real humility is all about. Recognizing that you and God are totally sympatico. That's how they say it in Argentina, right?